It doesn't take long, having switched the radio on in ignorance, to know that something is wrong, that someone has died. The slightly unrealistic claims of character being made, then the realisation of the use of the past tense, then, today, the stunning mention of a name that you don't expect to hear. 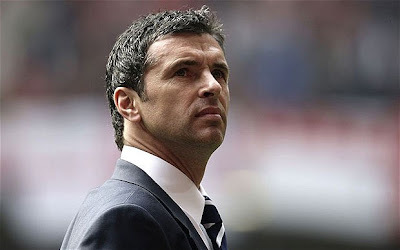 Gary Speed. Gary Speed? Does the photo above look like the final act approaches? The mind swirls with How? and Why? and the terrible dread suddenness and finality of death. Men were called upon to repeat the same tributes, and did so in dull, choked tones, all defeated. I had been visiting a church to preach, challenging those of us who love what we believe to love people more, to feel the devastation of personal loss rather than coldly remark on the logical conclusion of one's values being ignored. It's harder, which is why some of us shrink behind walls of impersonal certainties. Jesus didn't. The radio continued as the day's programme of sport did. Out of respect, the games should go on. One of his friends was due to play but realised that he could not. The match was at Anfield, a place too well-acquainted with the grief of untimely death. As the stadium announcer introduced the minute's silence, applause rolled round the ground. Then the awful non-sound, the absence of a thing which should be there. Then the whistle, and the roar, and the commentator admitted that football was a glorious irrelevance. I continued to drive, as men spoke and shouted and ran and kicked, and the sun set. I went home, to love and life, blessed with hope.